Los Glaciares is the Argentine national park in Patagonia. 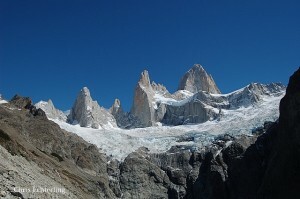 If you are going to climb Fitzroy, Cerro Torre, or any of the other amazing peaks, this is the park. It is a fantastic place, and once you are there, you will never want to leave. When you arrive in Argentina, you’ll land at EZE (Ezeiza International Airport) in Buenos Aires. Aerolineas Argentinas and LAN are the only airlines I know of that fly from Buenos Aires to El Calafate, although I did recently read an article that flights to El Calafate would increase, so perhaps there are more options now. Unfortunately, you won’t be flying out of EZE to El Calafate. . . you must take a taxi or other transport to the domestic airport: Jorge Newbery (AEP). I paid in the range of 100 Argentine pesos for a taxi. Arriving in El Calafate, you’ll be in a small airport, and there are bus services set up to take passengers in to town to the bus station. I would strongly recommend spending some time in El Calafate, if for no other reason than to purchase the bulk of your food. Perito Moreno Glaciar is also available as a quick trip from El Calafate. Once you arrive in El Chalten, food is available, but not nearly as much, nor the variety available in El Calafate. From the bus station in town, you can pick up any number of busses that will take you to El Chalten. It is a beautiful drive, but also a good chance to catch up on sleep. The bus I used dropped us off at the very large Rancho Grande hostel. This is nice, because the trailhead to Fitzroy is a quick walk up the street from the hostel. 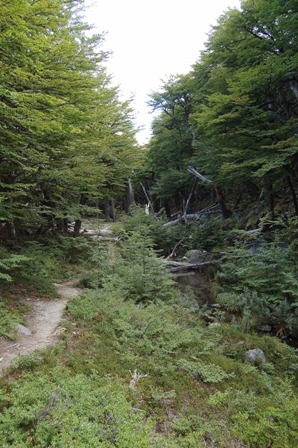 The downside is that you must walk all the way back to where the road comes into El Chalten to the Ranger Station to get your climbing permit first, and to get the trailhead to Cerro Torre. Rancho Grande had rooms at about 30 pesos when I was there. This is a great place to meet climbers, have some beer, watch TV, etc. Campamento Rio Blanco has running water! Across the street from Rancho Grande are some little markets where you can pick up some more food, chocolate, empanadas, and importantly, boxes of wine for the trip up to the base camp. From the road, when looking at these tiendas, you’ll see a little road/path to the right. If you go up there, there is a place where you can tent camp for just a few pesos per night. There is running water, bathrooms, and showers, plus a wind shelter with tables and benches for cooking. If you follow San Martin street away from the trailhead, towards the entrance to the town (and the Ranger Station), you’ll eventually come to a bigger grocery store just before the corner where San Martin ends. This is a good place to get any fruits and veggies you want, as well as dried sausages and salami (look for the dried chorizo, it is amazing) There is also an outfitter around the corner to the right. This outfitter was the only location I could find with white gas (bencina blanca) and kerosene (queroseno). The shop also had nice individual packets of various foods and condiments. There are fuel stations if you are willing to use auto gas or diesel in your stove. Also on San Martin are some bakeries where you can buy “facturas” (this confused me greatly at first, as factura is Spanish for bill or receipt, but in Argentina, they are a type of pastry too). Stock up on facturas and empanadas just before you head up to base camp. You’ll appreciate those things (and that important box of delicious malbec wine) while waiting out the weather in camp. There was an ATM in El Chalten when I was there. It is located closer to the entrance to the town, on the way to the Ranger Station. However, it was the only ATM I found. 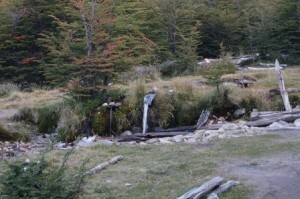 As you walk up San Martin, towards the mountains, you’ll arrive at the trailhead to the various campgrounds and Fitzroy. From that spot, it is about 3 or 3.5 hours walk on the trail to get to Rio Blanco for climbers, or if you are just trekking, maybe 2.5 to 3 hours to get to the trekking camp. Of course, that time is only for the first time you make the hike. . . I kept stopping to take photos which slowed me down considerably. Subsequent journeys back to town for more wine and facturas usually only take 2 or 2.5 hours each way. It is a beautiful hike. The camp is quite nice, with some latrines, a little cabin for cooking, eating, and waiting out storms, and a small stream nearby with potable water. We were all drinking directly from the stream with no ill effects. There was a sign up indicating that the water was potable, so check before you drink. 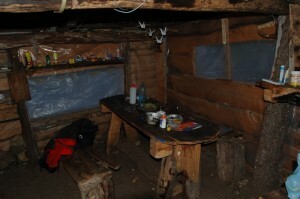 On the trail near the camp is a 3 sided shelter for trekkers to stop and rest or have lunch. Near that shelter is a nice spot of grass that gets some sun. This is a good place to relax and dry gear on days that are too windy to do much of anything. During the briefing at the Ranger Station, they indicated to me that camping outside of the designated camps was prohibited. However, climbers could bivy on the approach of their climbs. In addition, climbers were asked to pack out their waste from Paso Superior. Please respect these rules and keep Patagonia beautiful. It doesn't get much better than this - Fitzroy on the right. I used Aerolineas Argentinas. They require a telephone check in 72 hours before the flight. There are several telephone shops, some with internet, available along San Martin for this purpose. I ran into extremely long wait times on hold for Aerolineas, and had to return to a telephone shop about 3 times before I finally was able to speak to a customer service representative. Another thing to keep in mind is flexibility. Things go wrong, schedules change, etc. Keep a positive attitude. Aerolineas changed my flights both going and returning from El Chalten, but they did take care of me and paid all my expenses (taxi, hotel, dinner) to spend the night in Buenos Aires. Being friendly goes a long way. Even though I speak Spanish, Aerolineas used English speaking staff, and they called the taxi company and the hotel, and had everything pre-arranged. All I had to do was wake up, get dressed and walk down to the lobby of the hotel where the taxi was already waiting for me. I enjoyed my free night in Buenos Aires, it is one of my favorite cities. Please feel free to leave any questions in the comments section. Patagonia is a very special place, and I hope this little guide helps you get there and enjoy it!